Data Source: Authors’ analysis of Behavioral Risk Factor Surveillance System data for 2011-13 to 2015. 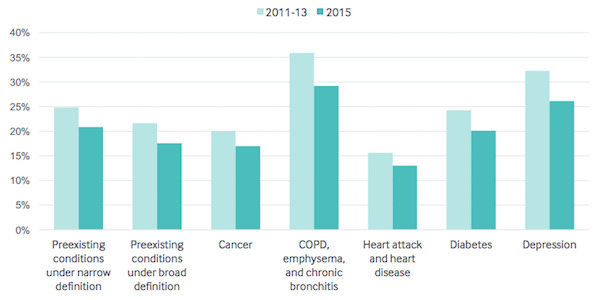 Source: The Commonwealth Fund: Access to Coverage and Care for People with Preexisting Conditions: How Has It Changed Under the ACA? This entry was posted in Data Watch on June 28, 2017 by Genevra Pittman.